When Elvis’s Crying in the Chapel reached #3 on Billboard’s Hot 100 pop chart on June 12, 1965, it was an amazing achievement for three reasons. 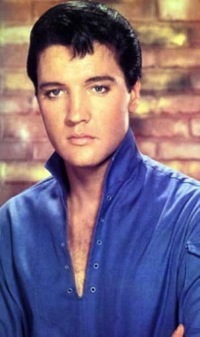 First, Elvis had been out of the chart-topping loop for some time. He hadn’t had a top 5 single since Devil in Disguise also reached #3 two years earlier. Second, Elvis recorded Crying in the Chapel back in 1960, when it was left off the playlist of his religious LP, His Hand in Mine. Third, it was a gospel hymn, and gospel hymns hardly ever made the Hot 100, much less reach the top 5. 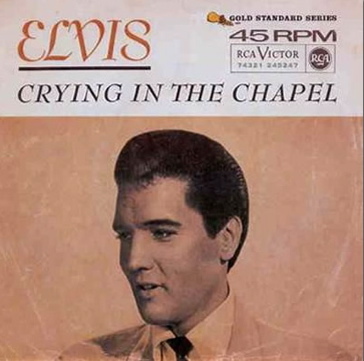 The unanswered question at the time was: what effect would the success of Crying in the Chapel have on Elvis’s stalled career? Before answering that question, though, let’s take a look at the song’s history. First of all, Elvis was just one of many singers who covered the tune. Country singer Darrell Glenn had the first hit with the song back in 1953. That same year June Valli took the song to #4 on the pop chart and The Orioles reached the top of the R&B chart with their version. 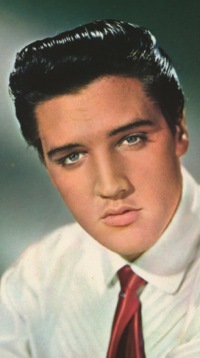 Elvis probably heard several versions before starting his recording career in 1954. It wasn’t, however, until October 31, 1960, that Elvis recorded his own rendition at RCA’s Nashville Studio B. 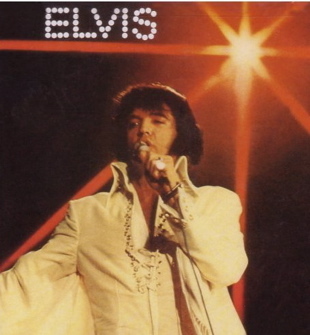 In his recording sessions book, Elvis Presley: A Life in Music, Ernst Jorgensen seems to suggest that it was Elvis himself who came up with the idea to record the song. Jorgensen also reported that, “The recording log for early morning on October 31 says that no satisfactory master was completed, and ultimately the song was not released until 1965, when RCA was desperately combing the vaults for unreleased material.” Anyone who listens to the beautiful 1965 released version, however, would wonder how it possibly could have been judged unsatisfactory back in 1960. Gordon Stoker explains it this way. “At the time, Valley Publishing Company held the rights to ‘Crying in the Chapel.’ As you know, Elvis couldn’t record anything that the Colonel didn’t own or didn’t make a deal on. So they contacted Valley Publishing, and they wouldn’t make them any kind of deal. So the Colonel said, ‘OK, just keep it in the can.’ They would say anything to please the Colonel or RCA in those days. Now let’s jump back to the summer of 1965, when Crying in the Chapel was riding high on the Hot 100. Its success did not jumpstart Elvis’s recording career again as Elvis and the Colonel might have hoped. Elvis would not have another top 10 single on the Billboard Hot 100 until In the Ghetto reached #3 in 1969. However, in 1965 Colonel Parker thought the success of Crying in the Chapel pointed the way toward a profitable new path for Elvis’s career. On February 9, 1966, an article headlined, “Ex-Rocker Elvis … Gets That Religioso Beat,” appeared in Variety. Writer Joe X. Price began his article with the following revelation about Elvis’s coming career change. Obviously Colonel Parker had sought out Price and fed him a line of malarkey, hoping to promote his own concept for a new direction in Presley's career. Price took the bait and ran with it. Amazingly the writer included the following information provided by Parker without bothering to check the facts, something that needed to be done whenever the Colonel opened his mouth to promote Elvis. Of course, the Colonel didn’t realize that “Crying in the Chapel” not only was not the name of LP recorded five years previously, but also that the song wasn’t even included on His Hand in Mine. No matter. Parker already had sketched out plans to make Elvis America’s great gospel crooner. Crying in the Chapel had been released in April 1965 to capitalize on the Easter holiday period. The timing worked well once; why not keep doing it? For the next four years, RCA issued Elvis religious records at Easter time. There were two in 1966—Joshua Fit the Battle / Known Only to Him and Milky White Way / Swing Down Chariot. The spring of 1967 saw the release of Elvis’s How Great Thou Art album. The Easter offering in 1968 was the single You’ll Never Walk Alone, and the following year His Hand in Mine / How Great Thou Art was released as a single in March. 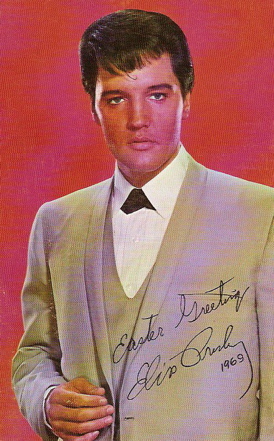 Parker’s promotion of Elvis as a religious singer was not limited to the annual Easter record releases. 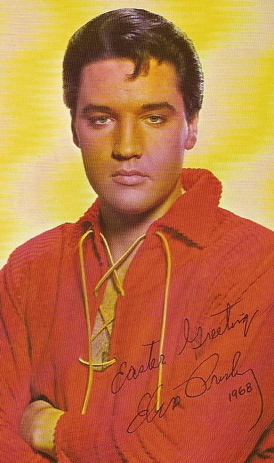 RCA distributed Easter postcards of Elvis to record dealers. The Colonel also produced radio programs featuring Elvis’s sacred and Christmas music. A full-page ad in the March 18, 1967, issue of Billboard announced Elvis’s “Special Palm Sunday Nationwide Half-Hour Easter Radio Program.” The ad listed radio stations in all 50 states that would broadcast the program featuring songs from the recent How Great Thou Art album. Another Presley radio broadcast (perhaps a rerun of the March program) was disseminated to more than 2,000 radio stations to be broadcast on December 3 and 10, 1967. Of course, Elvis probably didn’t object to his manager’s efforts to promote his religious music. 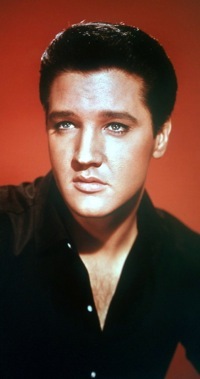 After all, Elvis had enjoyed listening to and singing gospel music since he was a youngster in church. He released Peace in the Valley, a four-song sacred extended play record in 1957 and sang the title tune on The Ed Sullivan Show. And some of sixties Easter recordings earned critical acclaim. His How Great Thou Art album in 1967 won Presley his first Grammy, and the following year his single of You’ll Never Walk Alone charted briefly on the Hot 100 and was nominated for a Grammy. Still, it’s hard to imagine that he shared his manager’s vision of him becoming primarily a Christian crooner. In fact, it was Elvis himself who finally put an end to the Colonel’s designs for him in that direction. When he signed Elvis on with NBC for a December 1968 TV special, Parker insisted that the program consist of Elvis singing an hour of religious hymns and Christmas songs. For once Elvis refused to let the Colonel have his way, and the successful “Comeback” special opened the way for Elvis to return to live performances in Las Vegas and across the nation. 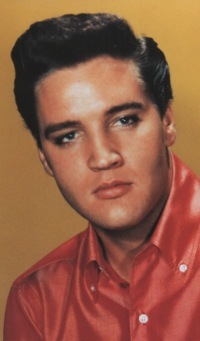 That put an end to the idea that Elvis would morph into an aging gospel singer. "In 1965 Colonel Parker thought the success of 'Crying in the Chapel' pointed the way toward a profitable new path for Elvis’s career."